Care2 Causes | What Is the 'Antifa' Movement All About? What Is the ‘Antifa’ Movement All About? You may have heard the term ”antifa” tossed around in news reports, perhaps referring to the “far-left” or “radical left” — but what’s actually behind this movement? In the wake of the Charlottesville, Va., white supremacist march, U.S. President Donald Trump appeared reticent to condemn on the violence and hate — and when he comment on the event, he suggested that the situation was the result of both right-wing and left-wing, or “alt-left,” extremists. A number of Trump’s supporters went on to suggest that antifa had as much blame as anyone on the far right. But many Americans haven’t even heard of Antifa beyond that passing reference. The name antifa is literally an amalgam of the phrase “anti-fascist.” Sometimes showing up at white supremacist events dressed in all black, these individuals exist for one major purpose: to counter right-wing activity — with physical force if necessary. Some within the movement identify as anarchists but, because antifa activists tend to shun the media — many believe the media is in part responsible for emboldening the right — it is difficult to say what proportion of the movement truly believes in principles of anarchy versus those who are simply there to counter white supremacy. As NBC news notes, there are now antifa groups present in most major cities across the United States. These activists tend to be young adults who organize through social media. The antifa movement has a long history in Europe in particular, but we will examine the group’s role in current U.S. political events. Trump’s inauguration was one of the first major flashpoints in which antifa gained press attention for their destructive protest — a “black bloc”-style demonstration inherited from the group’s European counterparts. Black clothing helps activists hide their identities and evade police, especially when members lack permits to protest. Many viewed these actions as a blow to conservative free speech, but the context of the event offers a less clear-cut picture. Yiannopoulos used his platform to systematically denigrate trans members of the student body who proested him. He frequently led social media attacks that directly fed into racist rhetoric until he was banned from Twitter. While, Yiannopoulos may be a perfect example of the “alt-right” perspective, protests against him cannot be seen as an attack on conservative politics. And antifa does not have a history of attempting to silence broader conservative thought. But is antifa equally to blame when things turn ugly? Can antifa be compared to the far-right in terms of a propensity for violence, as President Trump appeared to allude to when referencing Charlottesville? The clear answer is no. In the American contest at least, antifa usually only responds to far-right extremist activity — something at the heart of their ethos –and has never directly targeted people. Photos of supposed antifa members attacking police have been found to be digitally altered, and there is no credible evidence of widespread violence perpetrated by the group. Certainly, in the case of Charlottesville, antifa only represented a small contingent of protesters. While some small skirmishes broke out, major altercations were evidenced only from those claiming to belong to the political right. Therefore, the equivalence falls apart immediately. Marilyn Mayo, senior research fellow for the Anti-Defamation League’s Center on Extremism, said that statistics show that radical leftists have been dramatically less likely to kill people than their counterparts on the opposite side of the political spectrum. Over the past decade, extremists of every stripe have killed 372 Americans. 74 percent of those killings were committed by right wing extremists. Only 2 percent of those deaths were at the hands of left wing extremists. 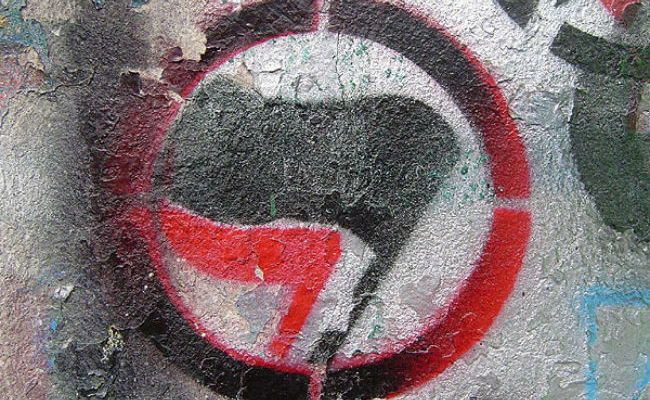 To suggest that antifa represents the radical “alt-left” overlooks the group’s nature entirely: without the right-wing white supremacy movement, antifa would not exist. Those on the more moderate left may wholly disagree with antifa’s methods, but that doesn’t mean we should allow the right to suggest that Charlottesville was the result of two extreme groups who were equally responsible. Antifa is a radical group bent on destruction. They are given to rioting and destroying private property. They are the ones who look like fascists, they are determined to stifle speech they don't like and to tear down monuments they don't approve of. Look up the Nazis in Germany, that is exactly what they did.